Hard-bound album with press-cuttings and other memorabilia concerning Dr James MacLachlan, former Provost of Dornoch, covering period 1893-1938. Album has stiff black board covers. Inside is a coat of arms and underneath printed "NEWSPAPER CUTTINGS. 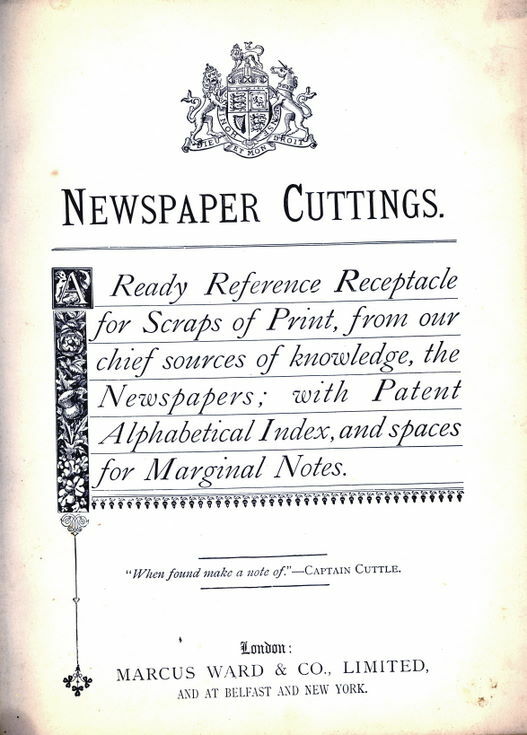 A Ready Reference Receptacle for Scraps of Print, from our chief sources of knowledge, the Newspapers; with Patent Alphabetical Index and spaces for Marginal Notes". ' "When found make a note of." CAPTAIN CUTTLE' "London: MARCUS WARD & CO., LIMITED AND AT BELFAST AND NEW YORK." with a decorative bar down one side. Inside the pages are full of newspaper clippings, some with notations; notices; photographs; poems; dog licence & library cards etc. First date 1893. Last date 1938. I need more information on this book. I have the first original book. I am a relative of the late Dr. James and would like to know how I can obtain a copy of this book please. ~ Thank you for your enquiry. The book is a collection of newspaper articles that have been cut out and stuck into the book. You are very welcome to view the book in our archive by making an appointment with the Curator. ~ Administrator.